Words fail to describe Dear Evan Hansen, if I’m honest (please, someone find that reference funny). I’m going to call this a ‘half review, half fan-girl’. I’ve been dreaming of seeing this show since I first heard the soundtrack a few years back. As I stood at my spot watching people flood into this tiny theatre (which doesn’t feel much bigger than the Prince of Wales theatre in London, for anyone who wants a reference), I had no real idea what was in store. I knew the story was different to how the soundtrack made it seem, but not on this scale. This plot summary is a bit of a spoiler. So if you’re waiting to see it on Broadway, or for its West End transfer, I’d skip the next paragraphs. Evan struggles to hold on to his friendships. He worries about his sweaty palms (which aren’t actually sweaty) and trips over his words. We don’t ever delve much deeper into his mental health issues, but he has been given the task of writing letters addressed to himself to keep positive. When printing out a finished letter, Connor Murphy, an emo-ish boy who also struggles with friends, uses the letter to blackmail Evan. For a reason we never find out, Connor commits suicide and the only thing left in his possession is the letter addressed to Evan. It’s obviously an extremely hard and emotional time for his family, but they find this letter and assume that Connor wrote the letter to Evan before he died. In a slight state of panic, during ‘For Forever’, Evan starts to lie about a friendship he had with Connor; the things they used to do, places they used to go, and the emails they’d sent to each other which had dated back years, all to try and help the hurt that Connors’ family are dealing with. The story is elaborated until thousands of people are supporting ‘The Connor Project’. For the first time, Evan has friends, people are supporting him, and he gains a second family in Connor’s. He continues to spin this ever-crazier lie but after suspicions arise over the validity of his emails, Evan can’t handle the pressure and finally admits to lying about the whole situation, losing the support of his friends, and Zoe, Connor’s sister and Evan’s girlfriend. Obviously there’s a lot more to the plot, but I’m not writing a dissertation on this show and I do want to leave some surprises. If you don’t love Pasek and Pauls’ genius score then, personally, I think you’re slightly mad. You gain a whole new-found appreciation for these lyrics, the characters who sing them, and the way the songs slot into the story. Who knew a show could be so hilarious and so sad at the same time? You laugh, sob, and laugh through you tears. It’s all down to the wonderful portrayal of Evan (Taylor Trensch), Zoe (Mallory Bechtel), Jared (Sky Lakora-Lynch) and Evans’ mother Heidi (Lisa Brescia). Lisa’s solo towards the end of the show, ‘So Big, So Small’, was one of the best things you can witnessed, (up there with Margaret New singing ‘He’s My Boy’ in Everybodys talking about Jamie). Ben Platt originated and won a Tony award for the role of Evan and he’s the voice we all get to know on the soundtrack, but Taylor brought something new and wonderful to Evan; a more nervous, even less confident air. Although he’s slightly pitchy at times, we can blame that on emotion and connection to the character. Only two things let the show down: the cast was tiny. Although this made the incredible sound and harmonies they made all the more impressive, you feel slightly underwhelmed when they were all on stage. We hear about how Evan has no friends, yet we only meet two of his classmates, who both seem to tolerate him. You can also wonder whether the end could have been very different in an alternative universe. Of course, it’s lovely that Evan is forgiven and can move on, but with everything he did and all the lies he created, he got off very lightly. Overall, a mesmerising show. 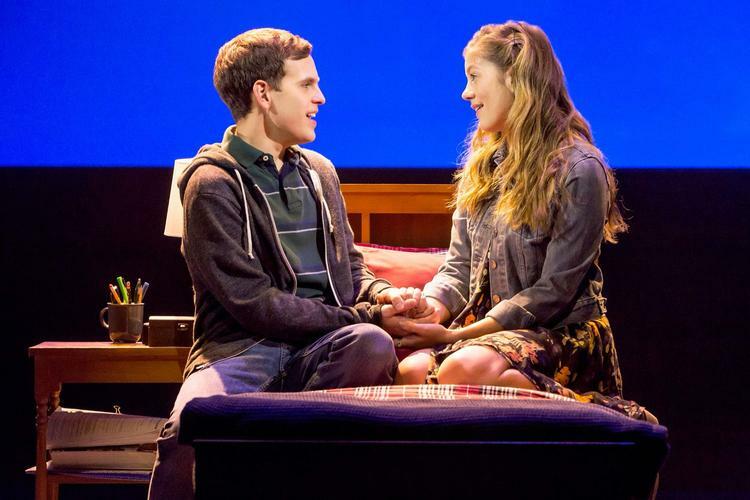 Dear Evan Hansen doesn’t look like it’s closing any time soon on Broadway, so get saving those dollars to come down to The Music Box Theatre. Or just keep hoping it’ll hop over the pond soon and get thinking about your dream West End cast, I know I have mine. I am in love with the soundtrack too! Can't wait after reading this for the transfer!